Did you have a great New Year's Day? Mine has been absolute fun. I am looking forward to this year - there will be plenty to do for me; lots of travelling abroad, changes... but more about each of those as they come. 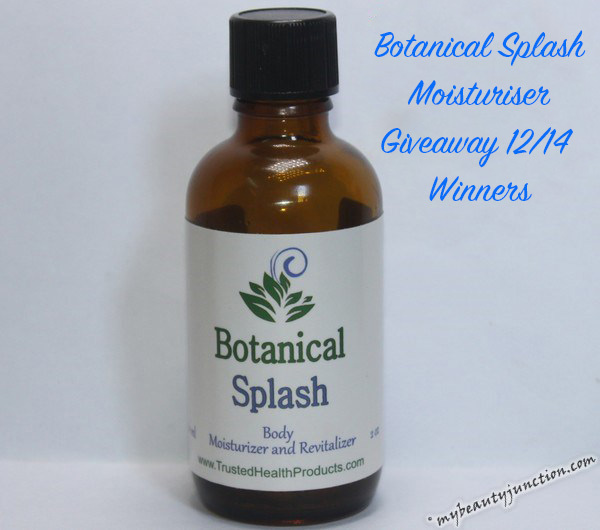 If you participated in the Botanical Splash natural body moisturiser giveaway, you must be wondering about the results. To those who won - congratulations! I will be contacting you shortly, so please reply immediately with your details. To those who did not win, it is my second blogiversary this month and of course there will be two giveaways beginning this very month, with great prizes, so you certainly have plenty of opportunities to win something nice for yourself. Here are the names of the winners! For those who cannot see the Rafflecopter widget here, please visit this page. I am tired after all the celebrations over the last 30 or so hours and am crashing early. Speak to you tomorrow with an unboxing post.